HOW CAN WE HELP YOU WITH YOUR APPLICATION? CONTACT US AT (800) 592-2050! Kalamazoo Industries Inc KM10 mitre saw 10 inch industrial abrasive mitre saw that can mitre cut ferrous materials such as angle iron, flat stock, bar stock 45 degrees left or right. The saw was originally built to a customer’s special request for a rugged, high capacity 10” mitre abrasive chop saw. The KM10 10” abrasive mitre chop saw features cast aluminum trunnion and arm, heavy duty base, 4400 rpm spindle speed, sealed ball bearings, dual V-belt drive, and dual cam vises. Capacities are 1.5” solid, 2.5” pipe at 90 degrees, and 1” solid 1.5” pipe at 45 degrees. The saw is available with a powerful 3HP motor in 220 volt 1ph, or 220/440/575 voltages 3ph. Kalamazoo Industries Inc. KM10 Mitre Saw 10 inch industrial abrasive mitre saw has applications in the following industries: Energy, Oil/Natural Gas, Petro/Chemical, Knife Manufacturing, Automotive, Metal Foundries, as well as many other Manufacturing and Fabrication environments. Handles any form of abrasive wheel that has a 5/8th spindle arbor. Great for cutting angle iron, bar stock. All parts are replaceable no matter what the age of the unit is. Great for small small jobs! Cuts 0 to 45 degrees – left or right. Positive index holes – up and down stops. Comes with locking pin. Capacities: 1 1/2″ solids, 2 1/2″ shapes @ 45 degrees. Shipping dimensions: L 27″ x W 39″ x H 31″. 3PH amp draws: 230V 8.4 amps and 440V 4.2 amps. 1PH amp draws: 110V 24 amps and 230V 12 amps. Shipping weight is approximately 220 lbs. 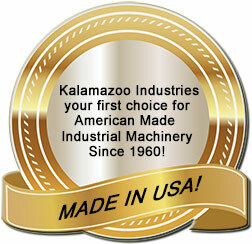 Kalamazoo Industries KM10 10″ abrasive mitre saw parts list. kalamazoo industries km10 10″ abrasive mitre saw cut sheet.